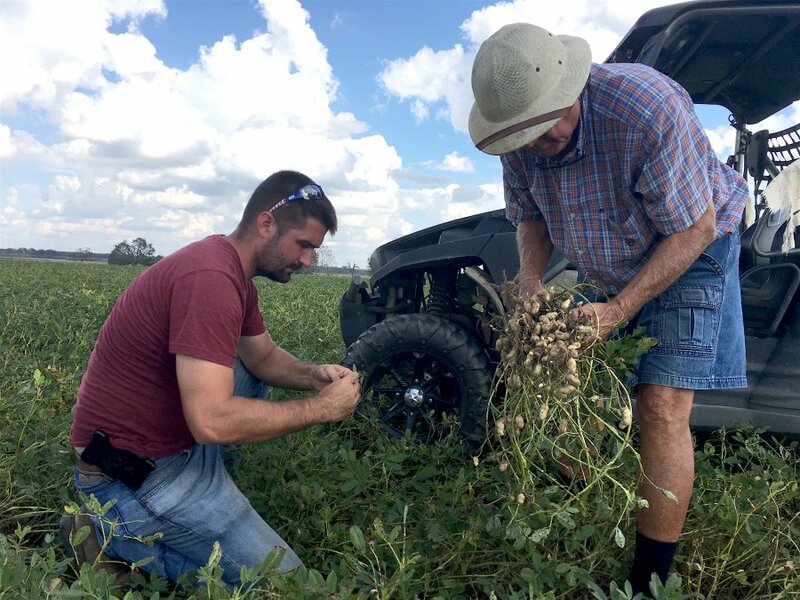 Just weeks after Hurricane Michael blew across southwest Georgia, area farmers have moved from a state of shock into full recovery mode. Before dealing with their own losses, many farmers in Decatur, Early, Miller, Mitchell and Seminole counties helped clear roads, cover roofs and check on their neighbors. In Decatur County, fifth generation farmer Bobby Barber, Jr. lost his poultry houses but hopes to salvage his peanut and corn crops. Across the county, Jeff Barber is thankful that he and his wife and children are safe. At 50, he’s lived through tornadoes, but Hurricane Michael was a new experience. The storm “laid down” Barber’s sweet corn, but it stood back up and may be salvageable. His chickens, which “pay the bills,” he says, and his cotton crop were destroyed, and time will tell how much of his peanut crop can be saved. In an effort to keep a sense of normalcy, Barber’s children still went to the Georgia National Fair last week to show animals with the Decatur County 4-H club. Neighbors stepped in to haul the animals to Perry, Georgia, as Barber’s trailer lies mangled beneath a huge tree. Bostick, who joined the local Extension office on April 1, says she too was in a state of shock over the damage the hurricane caused. Just to the west in Seminole County, UGA Extension ANR agent Andrew Warner says other storms he has lived through were nothing like Hurricane Michael. “This was like a 50-mile tornado that came through and tore up the town. The 1,000-year flood is no comparison because we only got about 4 and a half inches of rain and that was before the storm hit,” he said. With Donalsonville, Georgia, being 100 miles inland, Warner, like many others, didn’t expect the amount of damage that occurred. When he realized the storm wasn’t slowing down, he opted to ride it out in his truck, rather than his house. Warner said that across Seminole County, the hurricane destroyed equipment sheds and open pole barns. On one farm, a grain bin lays mangled in a field. “The farmer says it’s not his and he has no idea where it came from,” he said. Cotton and pecan crops were “hammered,” and the leaves were ripped from cotton and peanut plants. “We won’t have to defoliate what little cotton that survived,” he said. Cotton is the county’s largest crop in terms of acreage, and 75 percent of it is gone. Some late-planted cotton survived, but Warner says the grade will be “off” and the crop will be difficult to harvest. Pecan grower Rob Cohen is among the farmers who suffered the largest losses at the hands of Hurricane Michael. He and his brother grow pecans in Decatur and Seminole counties. “We have a 45-acre orchard in Seminole County that has two trees standing,” Cohen said. The trees that remain standing are those that Cohen had recently hedged, a process where large, bulky limbs are trimmed away. This helps prevent the limbs from breaking but cuts the tree’s yield for a few years. If he could have seen into the future, Cohen said he would have hedged more trees. The brothers have grown their business from 45 acres to 1,400 acres since 2002. Despite losing 20 years of work in a matter of three hours, they aren’t giving up. It takes about five years to establish a pecan tree and eight to 10 years for the tree to produce a profitable crop, Warner said. Personally, Warner was without power at his home until Oct. 23 and, he said, parts of Early County remain without power. The local Extension office has no phone service and cell phones in the area are have poor connection due to damaged cellphone towers. “The first three days were tough while we waited for the National Guard and emergency management agencies to get water here and set up a staging point. We had no power, no gas, no anything, and no one around here thought it was going to be that bad,” said Warner, who survived, at first, on beef jerky, chips and soft drinks. Looking back since the time the storm hit, Decatur County Extension Coordinator Lindsey Hayes still can’t believe what she has been through — gas stations with no fuel, many restaurants closed and, personally, she was without power at her home for two weeks. Hayes has received many phone calls and text messages from UGA Extension personnel who concerned for the area hit by the storm. “I knew the community was close, but it was amazing to see how everyone came together,” said Warner, who came to the county just a year ago. For an extensive list of resources to assist in preparing for or recovering from a storm event, visit extension.uga.edu/topic-areas/timely-topics/emergencies.